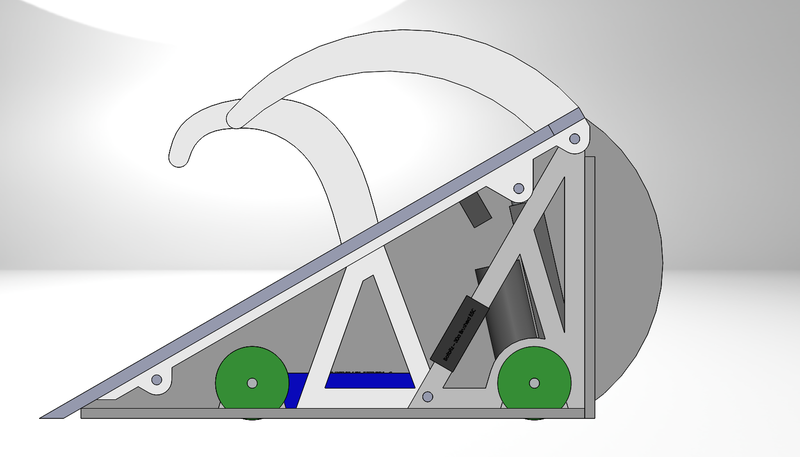 So after several days of CAD design, several weeks of reading other build diaries and learning electronics, and several years of wanting build something, I've come up with a design for a machine that I think will work as a robot while also being easy to make. I've always liked the idea of control bots, from heavyweight/middleweight Complete Control, to antweights such as Krave Monster (US) and Flippant (UK), and have designed a feather to do much the same, with particular (almost shameless) inspiration from Flippant. The machine is a four-wheeled lifter, powered by a linear actuator, and made almost entirely of HDPE, 10mm and 20mm respectively. The gimmick of Barróg is to get the wedge under a machine, lift them up via the actuator, and essentially beach them using the 3 hooks up top and side wedges, before using the four-wheel drive to bring them where I please. The machine is fairly huge, with the base plate alone being roughly 400 x 500 mm, and while this is far larger then most feathers, the size is mainly out of necessity for 1. to allow a linear actuator to fit in the model, to extend to a sufficient height, and to keep the angle of the front of the machine at around 30 degrees. 2. to be able to fit most feathers on the top. The hooks are there to keep a machine from rolling off Barróg once the lifter has been raised, as well as to aid in self righting. The side wedges on the face are meant to be expendable, hopefully to allow spinners to chew through them, before the machine is beached, and the spinning weapon is kept at a safe distance away from the rest of the robot. 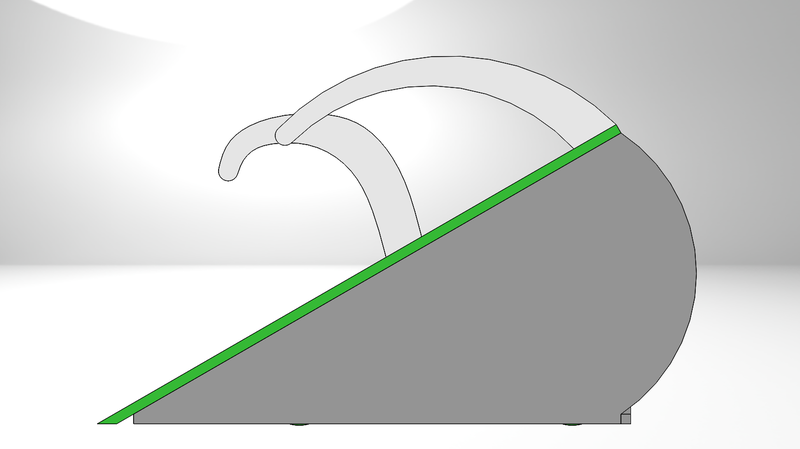 I may add further features to the face to aid in self righting when the machine is on its side, as well as a 2mm sheet of steel to the front of the wedge. So far, the only parts I've definitively bought are two Argos 12V drill motors, and am planning for two more, probably mounted with Alex's printed motor mounts. The actuator I've based this around is a 100mm stroke 12V linear actuator capable of lifting 180kg. I've calculated it's position, and have estimated that it should provide roughly 20kg of lift at the tip of the lifter, which should be more then enough. Speed controllers and batteries are still the parts of building I'm least familiar with, but the Botbitz 85A controllers are currently my first choice, one for each side. 30A would be preferable, and one will probably be used for the LA, although I'm not sure if that will be able to take two motors. Might even use the FeatherTwo ESC's if two can be configured for 4WD. The battery I have planned is a 3300mAh 5S 30C lipo, although I may downgrade to a 4S if it will be too much for the motors. LED's, a receiver and a safety link have yet to be settled on. I'm currently looking at Banebot wheels for movement, though I can't really come up with a size until I've got exact measurements of how far off the center of the motors will be from the ground. The current weight of the HDPE is slightly ridiculous: 8.46kg! I'm certain though that I can shave off some of that through optimization. Should the motors be 2kg, and the LA 1.3kg, I should be left roughly 2kg for batteries, ESC's, and further reinforcement of the body. Still need to figure out how to mount everything, presumably using barrel nuts and threaded bars. I still don't know everything, but hopefully what I've done so far is a good start, and I can't wait to start ordering parts once I've settled on everything! Special thanks to the build diaries of R9000 and dotDominic, which have been really helpful to read through. My personal feelings are that the top spines aren't large enough. The front lifting arm/plate is quite long and looks quite steep even though it's 30°. Featherweight fights are quite fast paced so what I expect might happen is that as you get under an opponent and start to lift them, they won't be far enough up the arm to be snared by the spines so may well just slip off or get turned over. If you attack a wide robot, the side tabs on your arm look like they'd stop the opponent from reaching the spines, leaving you unable to grab them as you lift. What is the distance from the tip of the spines to the lifter plate? It looks quite small though hard to tell from the CAD; I'd say the average height of featherweights is about 100mm, so ideally being able to accommodate that would be a good shout. A 5s pack should be fine and not cause a problem for your motors. The general rule of thumb for overvolting is 50% above the rated voltage, so 12V motors on 18V (or 18.5V in this case) should be fine. It'll give your actuator a bit of a boost too, as the load speed at 12V is only 5mm/s. I don't know the geometry of your arm to work out how fast that will be at the tip but, again with reference to the fast nature of featherweight fights, it might seem a bit sluggish or make it difficult to get a proper attack on an opponent. An idea is to make the prongs at the top static. I noticed from the antweight that it sometimes couldn't get a grip on robots. if they're lifted into static prongs, they're being pushed into them, locking them between the arm and spikes. Just a suggestion, also hi and welcome! Thanks for the replies you two. So first Jamie, cheers for telling me about the reduced price on Gimson's website, that's actually pretty helpful! I had originally seen the spines as simply a way to hold bots when the lifter was raised, and to self right. Likewise, I saw the side teeth as a disposable way to beach spinning weapons, and that they would simply hold a wide bot in place diagonally. 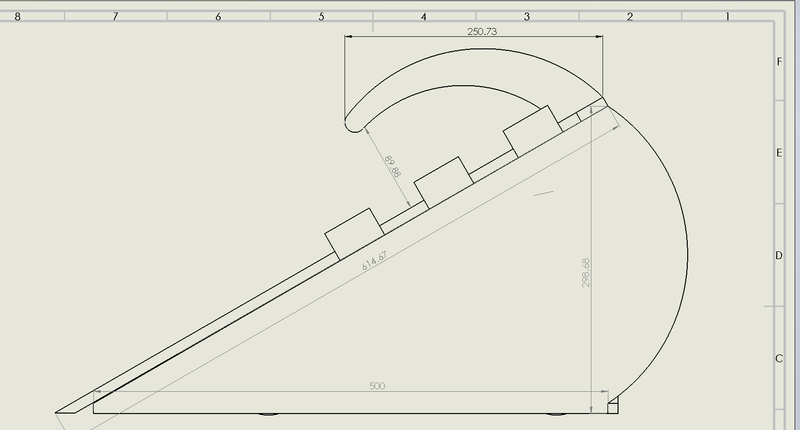 I've included a drawing of the general measurements of the bot below, with some key measurements. Upon looking at it again though, I can see your points. I definitely have to lengthen the spines out and up. 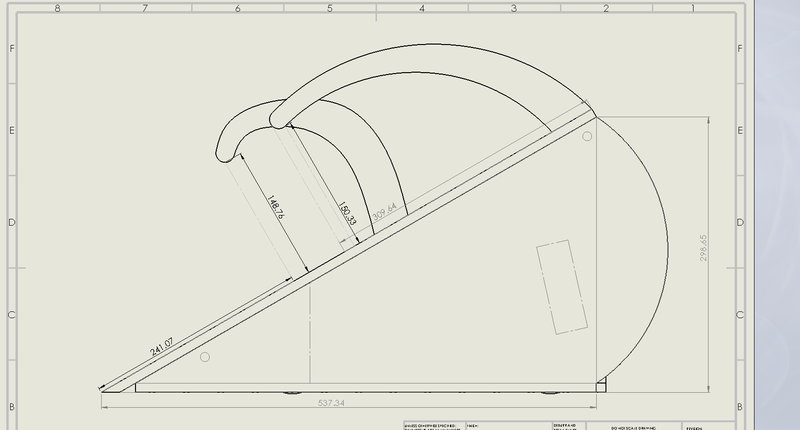 They're made of 20mm HDPE in the drawing, so I'll see what that'll do to the weight and adjust accordingly. Also, some math. The face is horizontal when the actuator has moved 37mm. The machine can in theory lift 21.8kg at the tip, so it's basically under it's max load if lifting a feather. Over-volting the Actuator gives me 7.5mm to lift, so that's a little over 5 seconds to just get the lifter horizontal. That ain't too impressive I'll admit. The 400kg LA on Gimson's website looks promising as well however, and I bet that with a little positioning, I could potentially get that time under 4 seconds with it. Still not too impressive, but a little better than before. 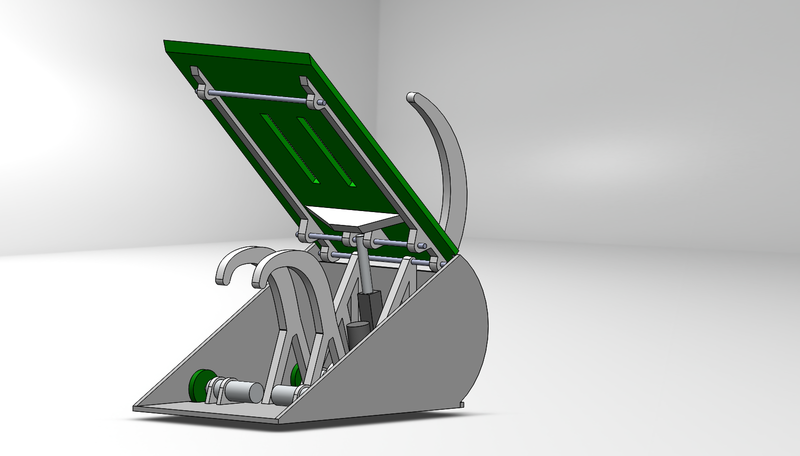 Alright, so I've done some re-modelling on the CAD, and come up with some potential new ideas for the lifter. 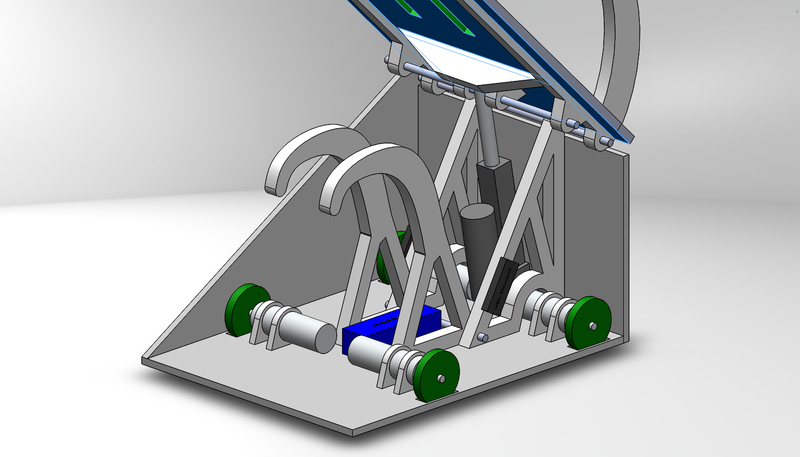 The largest change is an alternate design that would turn the robot into more of a clamper than a lifter. I've replaced the 3 spines with 2 that are still attached to the spine for self righting, and 2 that are mounted onto the body. The function of these are that a machine will drive up onto the face, and when the lifter raises, they will get caught between the two spines. This shortens the amount of time the weapon takes to be effective, and should hopefully be able to keep the opponent's wheels off the ground. The lifter will still be able to bypass the front spines, allowing for the full degree of motion at the back needed to self right. All spines, front and back, are now 150mm above the face, and should fit most FW robots. I still have to refine how I mount the new spines internally, although that will probably involve overlapping the front spine mounts and the lifter mounts and threading a few bars through both. I also have to decide whether I stick with this new clamper design, or whether I refine the lifter design (eg. Extend the back spines so that when a machine is tilted off the ground, it will catch between the spines and the face at just a few cm up). 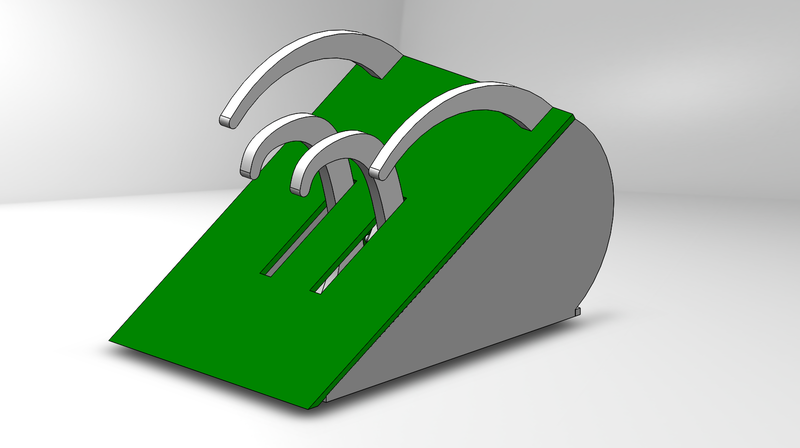 Or I could design the machine to work around both and have the front spines interchangeable. There is also the issue of whether the force exerted (roughly 25kg) will be enough to hold an opponent in place. I've been looking at a more powerful linear actuator on Gimson's website that has over two times the force of the current actuator, and is faster to boot, although it's increased length, weight, and asymmetry would lead to another redesign of the machine. That will probably be done in a few days, but I certainly think it's worth a go. Last edited by Shooty; 13th June 2017 at 15:43. So this will hopefully be the last update I make before I start buying parts. I've redone the lifter and claw mounts to save weight while maintaining strength, strengthened the point where the actuator meets with the lifter face, and inserted the batteries and ESC's to where I think they belong. I've settled on using the 30A botbitz speed controllers for both sides of the drive, which I feel is enough, although I still need to figure out where to get them if Ranglebox don't have them in stock. I'm going to try to get the Storm S603 receiver (listed below) and connect it via DSM2 with my modified Devo 7E. At the moment, the HDPE is predicted to weigh approx. 9.4kgs. Adding up the weight of the batteries, ESC's and motors, that adds up to 13.28kg, so it's obvious I'll need to cut some holes to save weight (I already have a few areas in mind for trimming). Also, for some reason, I haven't added in the "wings" on the side of the machine in the CAD, but rest assured, I'm planning to put them on ASAP. I haven't registered yet to Robochallenge 2017, as I still have these last few details to confirm. But if I think it's possible to have the machine assembled in around 2 months, then that would be absolutely fantastic, and almost a dream come true. I'd love to bring something to Robochallenge, even if it gets absolutely trashed. I'd love to get any feedback on whether or not this design is good enough to work, or at least is in a position to start to be built. Even if you don't think it'll be fully ready in time for Insomnia, or if you don't want to jump straight into the deep end with full combat, you could always bring it along for whiteboard fights if it's okay with the Coopers. Gives you a chance to get a feel for the events and test out your robot without the risk of destruction. That said, if you're game for it, then I'd also recommend diving right in! Just looking at the redesign, one thing to bear in mind is repair and maintainability. Because it's a relatively steep angle/high robot, getting your hands in to work on parts of it could prove tricky, especially as the lifter covers the entire face of the robot. If you haven't already accounted for it, maybe design the lifter to be easily detached by hand for easy access in the pits, or for the side panels to be quick to remove. Designing them to be easy to remove by hand but not by another robot is where the challenge lies but that's all part of the fun The changes to the design look good though, looking forward to seeing it in the arena sometime. The whiteboard fights seem like a great idea, and I'd certainly love to compete in a few of those if I can. The main reason I've been trying to accelerate the bot building process is that I keep seeing more and more people applying for Insomnia, and even though I doubt the machine would be that much of a threat, I'd still be dissapointed to find out that I applied too late to compete! If I could show up to the event even without qualifying just to compete in some whiteboard fights, then that's just makes me all the more determined to get this machine finished by the end of August! 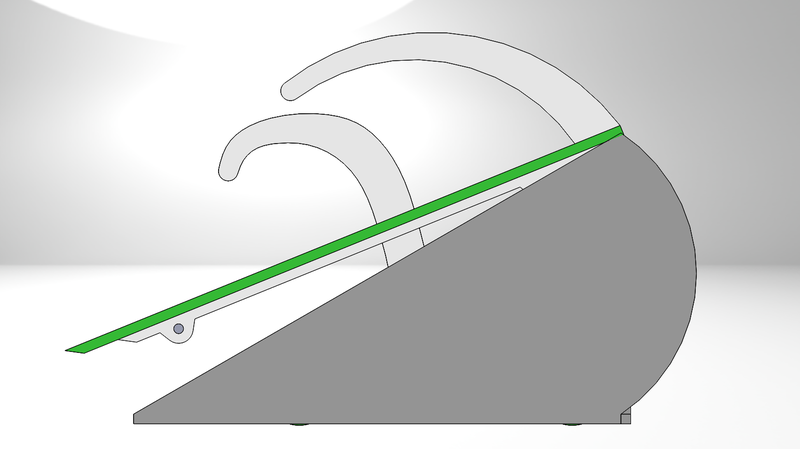 Thanks for the reminder about accessibility btw: I don't have it in this version of the cad, but I'm planning for the sides to be held in via barrel nuts and a threaded aluminum bar, so that should hopefully should allow easy removals of the side panels. I still have to figure out a way to remove the lifter and actuator bars in a quick manner: I assume that the bars will be threaded, so really I should try to keep the nuts and washers as close to the ends as possible. Looking really unique and I love the sound of the robot's name! I can't really tell from your CAD, what is the ground clearance? I would perhaps recommend increasing it - it might have difficulty moving around, and as soon as another wedge gets underneath your front the rear wheels will get lifted off the ground and you won't have any chance to drive away. Also I'm glad you found my build thread helpful! Hope it wasn't too cringey. 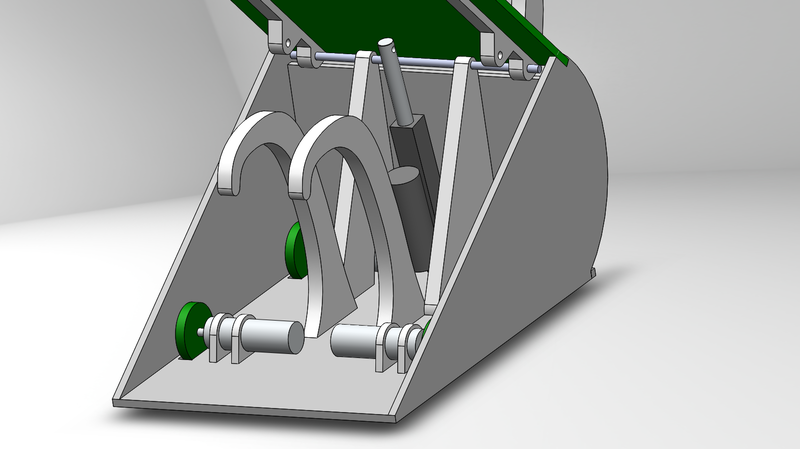 The ground clearance is currently the one thing that I have no way of knowing yet, since I'm planning on using 3D printed motor mounts for the drills, and I can't find the exact measurements needed for them. I'll get the mounts, temporarily mount a pair on a test piece of 10mm HDPE, and get wheels accordingly. I'm hoping to keep the clearance under a cm, but I'll have to wait and see.